Is Obama More Popular Than He Should Be? Among these presidents, only Reagan and George W. Bush have actual first-term approval ratings that exceed their expected approval ratings at a level comparable to or great than Obama. If anyone wants to read the 538 post, which has more details, and leave me some reactions here, I’d be grateful. This analysis will hopefully be part of an initial chapter of the 2012 book, which will focus on the broader political and economic landscape leading up to the election. Is “Even Jimmy Carter” Even a Good Insult? 16 Responses to Is Obama More Popular Than He Should Be? Beautiful graphs. Just wonderful–great job! 1. Put the presidents in time order rather than reverse-time order. 2. Remove the y-axis labels on all but the left column of graphs. 3. Remove the x-axis labels on all but the bottom graphs. 4. Put the presidents’ names lower on each graph. Implementing steps 2, 3, and 4 will allow you to reduce space between the graphs, so you can make the lines at a higher resolution for the same total space on the page. Andy: I did #1 on purpose because I wanted to highlight Obama. But I can see the logic of time order. You’re absolutely right on #2-4. It’s just additional work and I was a bit lazy. Something seems amiss. The residuals for Ike through W should equal out (over and under “expected”), yet virtually all appear to be over. What am I missing? Matthew: I’m not sure that’s the case if I’m doing out-of-sample predictions. So the estimate for Ike uses the 1948-2011 data but drops 1953-60. And the estimate for W uses 1948-2011 but drops 2001-2008. And the estimate for Obama drops 2009-2011, obviously. Does that make sense? I’m not sure, though my top-of-the-head guess is things should still balance out. Gelman, what say you? Just to be sure up-is-up and down-is-down, how’s it look if you just run it all together (i.e., all in sample)? Then the expected and actual are closer, with the residuals canceling out, right? I had the same thought as Matthew. It might be worth just checking/presenting the residuals in the full model (without dropping and re-estimating – i.e., don’t worry about overfitting/cross validation – given what you’re trying to do it’s not clear how relevant that is). In any event, if as it appears the average president exceeds his prediction, you might want to adjust the 9 point figure for Obama. But if the average president does exceed his prediction, I would be concerned that there is some underlying difficulty, and looking at the residuals in the full model might be a good first diagnostic. Thanks for all your work on the blog! It’s really a great resource. And I look forward to the book! Anything to the fact that the residual appears to be always negative? I see that one of your key economic indicators is the change in inflation. If inflation influences presidential approval simply because people consider inflation harmful, then your use of inflation in your model seems fine to me. If, on the other hand, inflation influences presidential approval through its effect on the economy, then you might want to consider that there may be an optimal level of inflation below which higher inflation is beneficial. For example, inflation may benefit the economy by providing an incentive to spend and invest or by reducing the real burden of debt. It appears that all presidents live in a Lake Wobegon world (“where all the women are strong, all the men are good-looking, and all the children are above average”) in which presidential approval is either approximately equal to the expected value or better than expected. A reader like me who doesn’t have much training in statistics is likely to be surprised that presidential approval is not below the expected value as often as it is above. There is a low level of inflation which is beneficial to all except those who live on fixed incomes. It makes owning a house a guaranteed investment, or, at least, that’s how the thinking went until the Great Meltdown. This is a great analysis — but I’ll add to the chorus of questions about why the residuals are nearly always negative. That just shouldn’t be the case, even with out-of-sample predictions. Does the hardening of partisanship have anything to do with Obama’s apparently better-than-predicted favorability? If Democrats are more intensely committed to his side, presumably that would lead them to remain more favorable than the model would have predicted. We know from Gallup’s surveys that for both Obama and George W. Bush, favorability is significantly more polarized than for their predecessors. The next closest in polarization was Reagan, who is the other president in your analysis whose favorability is higher than predicted. 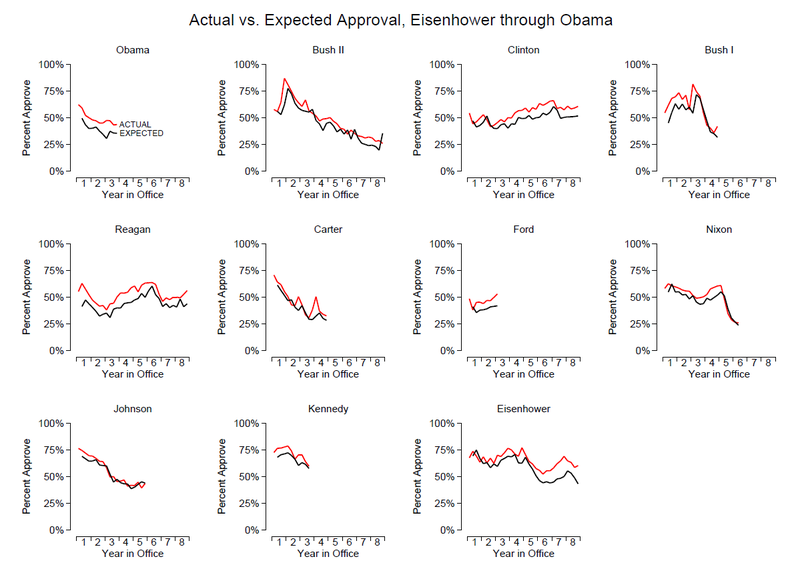 It seems that actual changes in a president’s approval seem to always precede the predicted/expected changes. In other words, when a president had an uptick in approval, the actual uptick, at least visually, seemed to almost always occur first, and then was followed by the predicted uptick. Just want to thank everyone for these comments. I am revisiting the analysis and will report back. One more quick point: you have Truman data in here but no Truman graph. By the way, I should say how much I appreciate all your work on this site. It is remarkable how much thoughtful analysis you and your colleagues provide. That you do so with evidence so we can have exchanges like this is truly commendable. Bravo. John Sides – Release the data into the wild! It would be nice to look at the data you compiled so others could possibly improve upon this analysis. There’s a blog over at the Guardian that does this for every post they do on numbers. I think that’s a good practice. Bee: All the data associated with the book project I’m working on — of which this analysis will be part — will be released with the book. For this particular analysis, that should come in late summer when we release a couple of free e-chapters.